Bead World is a very unique jewelry store that is located in downtown Palatine, Illinois. We feature a fine selection of traditional and ethnic pieces, old and new, as well a lots of beads, beads, beads! We have Semi precious stones, Swarovski Crystal, freshwater pearls, wood, bone, and other natural material beads, a great selection of glass from the Czech Republic, Vintage German Beads, fiber optic beads, sterling silver beads, findings and clasps in silver, 14K gold filled, copper, base metals and way too much to mention! We have a large selection of Indonesian glass beads as well, which are also available wholesale to qualified buyers. We also specialize in custom made unique bead jewelry. Bead World, Inc. opened in 1994 after perceiving a need for excellent and precious beads, collectibles and other unique jewelry in the Northwest Suburbs of Chicago. They have been diligently serving the communities around Palatine by providing for all bead, jewelry, piercing and collectible needs. Bead World is a cozy wonderland of artistic treasures tucked into a Palatine storefront. Despite the store’s name, owners Bobby and Martha Pafralides of Palatine don’t just sell beads. “We can do ear piercing, repair jewelry and make custom-made jewelry pieces,”Bobby says. 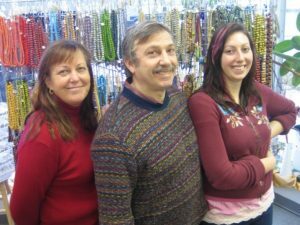 They opened Bead World in November 1994 because “there was a need for a good bead store,” he says.A tour of the well-stocked counters and displays reveals selections of loose beads from Italy, Czechoslovakia, New Zealand and Alaska. There are also ceramics from Peru and Africa, stringing materials and artifacts such as teeth and claws from lions and tigers. Beads range from 5 cents to $5,000. Some unexpected items include Byzantine icons, African masks, pocket watches and a wrist knife from Africa. “I can find anything that people want,” including collectibles and old African trade beads, he says. Bead World also sells more conventional offerings such as how-to books on jewelry making, tools, gift books and magazines.Bobby says there is no typical customer at Bead World. “We have customers from the youngest kids to 85-year-old ladies,” he says. “We were recently able to find some beads and string for a little girl and her brother who only had 95 cents to spend on a gift.”Noting that most of his beads are made from Moretti glass from Italy and not from plastic, he invites the bead enthusiast to come in and “scoop up a handful of beads.”He has also extended his knowledge into the community by speaking on the history of beads to schools and scout groups. “I want people to learn about beads,” he says.